Wildfires have destroyed massive stretches of land in Oregon. Due in part to its arid climate, California is known for wildfire activity, as not a summer goes by that dry conditions don’t result in vast swaths of acreage consumed by flame. While these conditions are typical in the Golden State, Oregon has also been under the gun for much of the summer. Since mid-July, wildfire has occupied the attention of area firefighters, after a lightning strike sparked a blaze in the upper reaches of Willamette National Forest, according to multiple local and national news outlets. So far, more than 500 square miles have burned, forcing well over 4,000 area homeowners to flee their properties due to safety risks, The Register-Guard reported. Since July 12, when the rogue bolt struck, several other wildfires in Oregon have ignited, resulting in traffic issues for commuters because stretches of road have necessitated closures, including portions of U.S. 20. Terry Krasko, spokesman for the U.S. Forest Service, noted that generally, Southern Oregon tends to have more moist air in August, but it’s been just the opposite this year, noting barometric pressure readings have been in the single digits. “That is very, very dry,” Krasko told the Register-Guard. 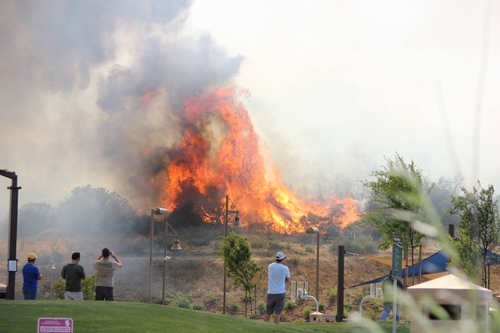 Scott Sherbourne, sales director at PayneWest Insurance, says homeowners can be proactive by setting up a defensible space surrounding their residence. Although fire crews are doing their best to get control of the wildfires, containment is proving to be an issue in certain areas. For example, on Aug. 12, more than a dozen blazes ignited due to a severe lightning storm, The Associated Press reported. While the resulting flames were put out before they had time to spread, their occurrence sapped emergency personnel from dealing with other blazes. As of Aug. 30, the Brookings wildfire was only 5 percent contained, according to the AP. Oregon is hardly the only state where wildfire is prevalent. At the end of August, nine states were reporting wildfire activity to the National Interagency Fire Center. These include five in Idaho, six in Washington and 18 in Montana, among others. Fire crews are charged with keeping the public safe from wildfire risk. Homeowners insurance provides the protection your belongings need when disaster strikes. If you have a question about your policy or making a claim, PayneWest Insurance is here to help. Visit our wildfire claim information page for more.